Acode has for several years produced functional clothing in a sporty Scandinavian design. The Scandinavian climate can be both wet, dry, hot and cold within a short time. Our Acode range can cover all these sudden changes in climate. The Acode range is also designed with space for your brand so that you can promote your company through personalisation using your company logo, name or image. Acode products are complementary to Fristads' heavy duty workwear with strict requirements on function, comfort, durability and quality. Acode provides garments for the lighter workwear category and every day adventures. Acode is a part of Fristads Kansas Group, one of the largest providers of professional wear in Europe. This combined know-how and experience means Acode can enjoy all the benefits of the development and production of products. It also means that you are never too far from the nearest dealer who can help you find the right combination that covers all your needs. Acode support the Fair Wear Foundation (FWF), an international organisation working for better working conditions in the global textile industry. Fair Wear Foundation is an independent, non-profit organisation that works with companies and factories to improve labour conditions for garment workers. Read more at www.fairwear.org. 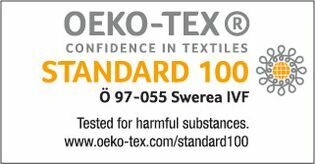 The product label "Confidence in textiles – Tested for harmful substances according to OEKO-TEX® Standard 100" is an independent, globally standardised certification system for all types of textiles. Since 1992, it has been providing a guarantee to retailers and consumers that the respective products are free from harmful substances. Read more at www.oeko-tex.com.